VACations everywhere! Today the LMAOBox community woke up to find that pretty much all of them have been banned. Read more here. This giant ban wave has hit platinum level comp snipers, high-tier traders with thousands of dollars in their inventories, and the creators of LMAOBox, though at least one transferred his entire inventory the night before so it appears they had something to do with the leak. MaxBox claiming he sent the debug version to Valve reinforces this, but there’s also evidence that he’s simply trying to take credit for something another user did. 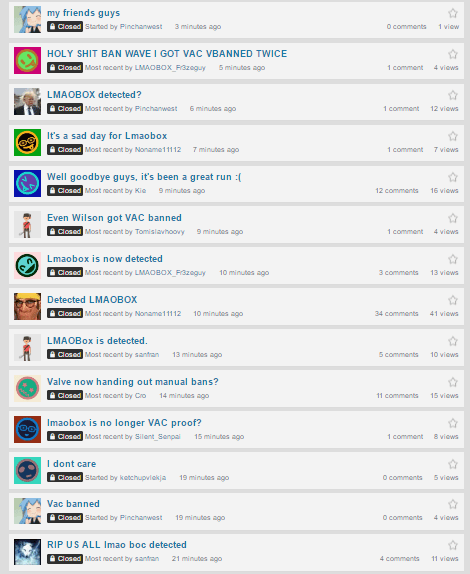 The LMAOBox creator has since released the premium version of the hack for free, stating that this is “the end of the lmaobox project”. So that settles that. Some people are wondering whether this means some other hacking program is going to replace LMAOBox and fill the void left by this ground-breaking VAC advancement, but I’m personally extremely pleased that this happened. LMAOBox needed to be removed, and Valve can deal with future threats when they arise. For now, the rest of us can play TF2 and enjoy Valve servers with significantly fewer hackers. Previous Previous post: Hydro Servers are back! Next Next post: Which classes in TF2 are Specialists and which are Generalists?